The title of this article is what I experienced over a year ago when my then 2-year old son was coughing so badly, he sounded like a seal pup barking. His cough had gotten progressively worse during the late afternoon and early evening. By the time it was bedtime, he was wheezing. Almost every parent has been in a situation like this where it’s late at night and there’s nowhere to take your sick child. It feels like there’s nothing you can do and you’re counting down the hours until the doctor’s office is open. For us, it was Sunday night and and our pediatric acupuncturist’s office wouldn’t be open for another 21 hours. I tried massaging the lung reflexology points on my son’s feet, but while it had relieved coughing fits before, this time it just wasn’t working. As I held my son tightly in the darkness, I was desperate. What could I do? In the past, I had played with the idea of sending healing qi (energy) through the palms of my hands. I’m not talking about Reiki (although it has much value), but what I am referring to is directing qi to shift cells at a molecular level and cause instantaneous healing. About 5 years prior, I’d taken a workshop by Dr. Richard Bartlett on Matrix Energetics. From that, I was able to occasionally alleviate minor aches or pains in my body. And even before that workshop, I had used qi to heal some bruised ribs twice as fast as the doctor’s prognosis. But I had NEVER been able to do this for someone else. I tried qi’ing the cat once. He swatted me. I tried practicing what I learned from Matrix Energetics on one of my classmates from TCM school. She experienced nothing. Nada! So how was I going to heal my son? And that was when feeling desperate with no other options became my best ally and that’s how it can be yours too. I decided I could at least try. I placed my hands on my little boy—one on his chest and one on his back—and envisioned a ball of qi between my palms. I tried to sense where the energy was congested and to clear it with my hands. Much to my surprise, my son let out a little sigh each time I did this. When I placed him into his crib to sleep, he settled down quietly and slept through most of the night with only an occasional cough. I had planned to take him to see the acupuncturist the next day. However, my son’s condition improved so much that it seemed like there was no reason to take him. He was fully recovered by the next day and that was the fastest I had ever witnessed him recover from a really bad cough and cold. There was no plausible explanation other than the qi had worked. As I pondered the situation, I realized that the reason it had worked was because I was desperate and had no other options available to me. It HAD to work. Basically, I had to get over myself. I had to get over my self-doubts and fear that I couldn’t do it. And I had to set aside any rational thought that said this was impossible. In that moment of desperation, was a sense of calm and stillness. I had to pull myself together in order to achieve what I had set out to do, which was to heal my son. It’s like when I’m flying on an airplane. I’m actually scared when there’s bad turbulence. However, when I’m on that plane with my son, I can’t allow myself to freak out, otherwise my kid will freak out too. I have to pull myself together and magically when I do this, the fear dissipates. It’s like I become this person who is not afraid of flying. If this is the first time you’re trying to heal with your hands, either for yourself or someone else, you need to be desperate to try it. I mean REALLY desperate, so desperate that you can’t allow yourself to freak out. So desperate that any sliver of doubt can not exist. Well, that’s the scenario you need if you want to experience almost instantaneous healing. However, if you’re willing to open a crack in your belief system and release thought patterns that limit your brilliance, you can start healing with your hands right away. The results won’t be instantaneous, but you might just surprise yourself at what IS possible. Here’s a step by step guide on how to heal with your hands. 1. Get a feel for the qi in your hands. The middle of your palms are considered to be very powerful centers of qi energy. To feel this energy, hold your hands in front of your chest as if you were lifting a bowl of water. Relax your hands, allowing them to curve naturally and hold this position for about 30 seconds. Imagine heat radiating from your palms. Keeping your hands in this relaxed curved position, turn your palms to face each other about 6 to 8 inches apart. You should imagine yourself holding a ball of light between your hands. Slowly move your hands closer together and then gradually pull them apart again. Notice if you can feel a magnetic field between your palms. 2. Place hands on area to be healed. When your hands feel warm, place them on the area of your body that you want to heal. If you’ve read my article on 5 Simple Habits to Improve Eyesight Naturally, this is where you would be “palming” your eyes. If you only use your own qi, you’re accessing a teeny tiny amount of the energy available to you. As well, you can deplete your own energy stores if you are continually giving your energy away to others. To prevent this, connect with Universal Qi to access an infinite amount of healing energy. Picture yourself as the letter “r”. The top of the vertical line is your head and the bottom of the line is your feet. 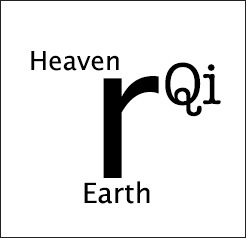 The curve of the r represents your hands. Your head is connected to the energy of the heavens and your feet are connected to the energy of the earth. Imagine yourself as a conduit drawing in energy from both heaven and earth through your body. Then, allow it to flow out through the palms of your hands. Don’t worry about trying to imagine this perfectly. When you start overthinking things, it stops the flow of energy. Just set the intention that you want to do this and trust that the Universe will take care of everything else. 4. When it feels right, remove your hands. It might be a few seconds or it might be a few minutes, but you’ve got to trust your inner guidance on this one. The Universe speaks to us in whispers so when it’s time to remove your hands, the whisper will be so soft that you will almost wonder if it was real. Yes, that is the voice. As a general guideline, children respond very quickly to healing energy. My son usually gets what he needs in a minute or two. He’ll push my hand away when he’s had enough. When I recently qi’ed my cat, he was done in about 3 seconds. He let me know by curtly walking away. Adults, us older folk, who have lost or forgotten our connection to Universal Life Force, usually need healing energy for a longer period of time. And that’s okay too. It is so great to read your messages and articles on Chinese Reflexology. I greatly follow in detail your suggestions. Your current article “How toheal withyour hands” is very thought-provoking and interesting one. This is somewhat similar to practising “Reiki” which I too have learnt and done III-Degree. Thank you very much for discovering and passing on to the world such wonderful and truthful remedies like Chinese Reflexology techniques for alleviating the miseries and sufferings of the people. I have only 2 requests to you. Kindly suggest the reflexology techniques for Vertigo/dizziness and also for enlarged prostate problems. Please. I shall be grateful. I am just in sixties. Thank you Murali. I really appreciate your comments and also for sharing more about Reiki and your experiences with it. I’m going to get a notebook and write down all of the questions from my readers in one place so that I do not forget them. I wish many blessings to you and your loved ones too. I have callouses all around the outside of my feet. What does that mean? I’d recommend checking your footwear first to see if that’s the problem. Skin callouses do not necessarily correspond to energy disharmonies with the corresponding reflexology points. However, over time, ill-fitting shoes can disrupt the flow of Qi to points on your feet, which can then affect the flow of Qi in your body. Take a look at one of my free reflexology charts to see if there may be sore points where the callouses are that correspond to different areas of the body. How to heal my vertigo and dizziness which I’ve suffered with for 8 years. I knew it. I knew their was something i could do. I spent all my life up till now looking for this answer. I know i had this power i spent so many nights crying only wishing i could save them. Their was a time i would of given anything to find out how i can finally use this. I read the entire article and now i have finally found this power. I now help the people i care about in this world because of you. Thank you, for being someone who has helped me save those i hold dear. I will never forget the kindness you helped me in saving their lives. May nothing but good fortune find you. thankyou. Thank you for your heartfelt words. It is hard to watch those we love suffer, but we must also remember that we can only help those who WANT to be helped. I appreciate your kind and giving heart. Continue focusing on the love in your heart and you will bring comfort and joy to those you care about even when they choose to hold onto suffering. And when they choose to heal, miracles can happen :). I was desperate and by prayer to God,in Jesus Christ name,I was healed.I felt his love all around me. I then prayed for others believing that through him I can do all things. Well, I guess you won’t know until you try :). Cultivating strong and vibrant energy within yourself definitely makes it easier to pass on healing qi to others. The reason I suggest this is because sometimes when a person is desperate enough to try anything, their mind will be open enough to enable them to connect with their higher energy vibration. Some call this Source energy, higher guidance, the Universe, God, the Tao, or even angels. I can’t speak to your experience or others, but it works for me :). and feel closer to healing.